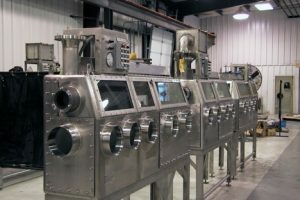 Waste Treatment Plant Gloveboxes – Petersen Inc.
Petersen Inc. has produced gloveboxes for the nuclear industry. The gloveboxes illustrated here provide a safe means for nuclear waste treatment plant technicians to transfer potentially contaminated samples from sealed nuclear waste canisters into a laboratory environment. Radiation shielding was accomplished using PCL controlled interlocks. Contamination control was accomplished by HVAC flow controls. These gloveboxes were designed and built by Petersen Inc. and conform with stringent American Glovebox Society (AGS-G001-1998) guidelines, and complex customer specifications and NQA-1 quality requirements. A complete stress analysis package as well as Operation, Maintenance, Installation, and Site Storage and Handling Manuals were developed.